Diabetic eye disease refers to a group of diseases that affect people with diabetes, all of which can lead to vision loss or even blindness. According to the American Diabetes Association, there are 20.8 million adults and children in the United States with diabetes. Over 6 million of these people do not know they have the disease. People with diabetes are either unable to produce or to use the insulin their body needs to convert sugar, starches or other foods into energy. The result is too much sugar in the blood. If you are a diabetic and have too much blood sugar, you are at risk for heart and blood vessel disease, kidney disease and a number of other diseases which also can affect your eyes. Cataracts: A clouding of the eyes' lenses, which develop earlier in people with diabetes. Glaucoma: An increase in intraocular pressure that can damage the optic nerve and result in a loss of vision. According to the National Eye Institute, diabetics are nearly twice as likely to get glaucoma than other adults. Diabetic retinopathy: The most common diabetic eye disease, diabetic retinopathy causes damage to the blood vessels in the retina. Diabetic retinopathy, caused by changes in the retina, is a leading cause of blindness in adults. It affects people differently. In some cases, the blood vessels in the eye may swell and leak. In others, abnormal new blood vessels known as neovascularization grow on the retina, the light sensitive area in the back of the eye. This is the earliest stage of the disease. 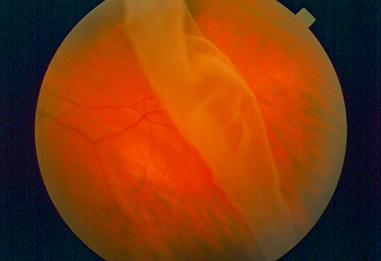 Swelling like a small balloon (microaneurysm) occurs in the blood vessel of the retina. At this stage, your vision may be unaffected and there would be no pain. Some of the blood vessels which nourish the retina are blocked. Your vision may still be unaffected. Many more blood vessels are blocked, depriving the retina of nourishment. These blockages signal the retina to create new blood vessels, called neovascularization. However, these new vessels are weak and may leak. At this stage, edema or swelling caused from leaking microaneurysms in the macula, the part of the retina that converts light into electrical images, may also become more pronounced and you may begin to notice a change in your vision. Although proliferative retinopathy can occur without symptoms, at this stage many more blood vessels are blocked. 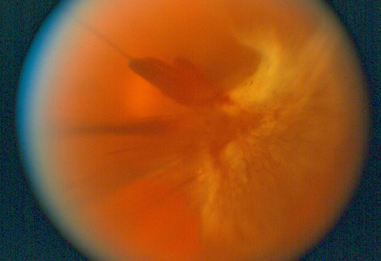 The neovascularization increases, and these weak vessels grow along the retina and the vitreous gel inside the eye. Because these new blood vessels are fragile, they may bleed into the center of the eye. If this happens, you will notice a blurring of your vision. In this stage, the swelling of the macula, known as macular edema, is more likely to occur, although it can occur at any stage of the disease. This swelling can cause fluid to leak into the center of the macula, the portion of the eye responsible for your fine, detailed vision. About half the people with proliferative retinopathy also will suffer from macular edema. In addition to blurred vision, at this stage you may also notice black spots or flashes of light in your central vision. These could be symptoms of a detached retina or vitreous hemorrhage, both of which can cause rapid loss of vision. If you notice any of these symptoms, you should see your eye doctor immediately. While lost vision cannot be restored, prompt treatment is essential at this stage to prevent further vision loss. Everyone with diabetes is at risk for diabetic retinopathy. It doesn’t matter if you have Type 1 or Type 2. If you’ve been diagnosed with diabetes, you are at risk. And, the longer you have the disease, the more likely it is that you will develop diabetic retinopathy. For this reason, it is important for all diabetics to undergo a dilated eye exam once a year. Early detection and treatment can prevent vision loss. Since both proliferative retinopathy and macular edema can occur without noticeable vision loss, your vision may be at high risk without regular exams. If you are pregnant and also a diabetic, you should see your eye doctor as soon as possible. More frequent exams may be required during pregnancy, as pregnancy can increase the risk of diabetic retinopathy. Once you have been diagnosed with diabetic retinopathy, you may also require dilated eye exams more than once a year. According to the National Eye Institute, studies show that people with proliferative retinopathy can reduce their risk of blindness by 95 percent with timely treatment and follow-up care. Following testing, the doctor will discuss the results and recommendations for treatment with you. If detected early, diabetic eye disease can be managed well in most cases with close follow up directed by your ophthalmologist. It's important that diabetics follow their treatment recommendations and maintain good control of blood sugar, blood pressure and cholesterol levels.